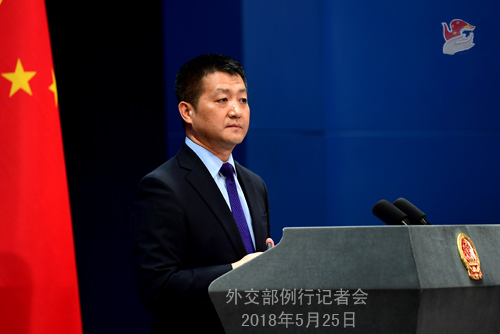 At the invitation of State Councilor and Foreign Minister Wang Yi, Minister of Foreign Affairs of the Plurinational State of Bolivia Fernando Huanacuni Mamani will pay an official visit to China from May 27 to 30. Q: We have noted that on May 24, US President Trump announced the cancellation of the summit with the DPRK, which was scheduled to take place in Singapore on June 12, and that he looked forward to meeting with the DPRK leader Kim Jong Un some day. The same day, the DPRK Vice Foreign Minister Kim Kye Gwan said his country is willing to sit face to face at any time and in any way with the US. As we noted, many countries and international organizations are regretful for the cancellation of the summit. What is China's comment? A: We have noted the latest remarks by the US and the DPRK on their summit as well as the setbacks in the preparations for it. In the meanwhile, we also noted that President Trump said he is still willing to meet with Chairman Kim Jong Un at appropriate time, and the DPRK also said they are willing to sit with the US to resolve the issue. With the recent hard-won momentum for dialogue and détente on the Korean Peninsula, the political settlement process is now facing a rare historical opportunity. All relevant parties, the US and the DPRK included, have demonstrated their readiness to advance the denuclearization of the Peninsula through dialogue and negotiation and made positive efforts to this end. The Chinese government's position on the Korean Peninsula issue is clear and consistent. We believe that the summit between the US and the DPRK, the two parties concerned regarding the Korean Peninsula issue, is crucial to advancing the denuclearization of the Peninsula. Under the current circumstances, we hope that the DPRK and the US will cherish the positive progress achieved recently, remain patient, send out goodwill to each other and meet each other halfway, continue to commit themselves to resolving each other's concerns through dialogue and negotiation and advance the denuclearization of the Peninsula. Q: After he announced the cancellation of the US-DPRK summit, President Trump said he knew the reason for the DPRK to call off the meeting, and he also mentioned China's influence on the DPRK previously on many different occasions. Some believe he is suggesting that the DPRK's change of attitude has something to do with China. What is your reaction to this? Second, there are opinions that the cancellation of the US-DPRK summit will give prominence to China's role and help it gain leverage in the next round of trade talks with the US. What is your response? A: First, as to China's role, like we said many times at this podium, China has always played a positive and constructive role on the Korean Peninsula issue without any ulterior motive at all. China stays committed to the goal of the denuclearization of the Peninsula, upholding the peace and stability on the Peninsula and resolving the Peninsula issue through dialogue and negotiation. This position remains unchanged all along. This is what we said more than 10 years ago and keep saying until today; we said so to the leader of the US as well as of the DPRK. At the same time, the political settlement of the Peninsula nuclear issue through dialogue calls for all the relevant parties, especially the directly concerned parties, to meet each other halfway and send goodwill to each other. Relevant parties shall think about how they are doing in this regard. Second, as to whether a more prominent role on the Peninsula nuclear issue will enable China to strengthen its hand on other issues, I would say there's no need to read too much into that. China's stance on the Peninsula nuclear issue remains unchanged and its position on its trade ties with the US is also explicit and open. We believe that the China-US trade relations are mutually beneficial in essence, and hope the US leaders and government will bear the global economic growth and the interests of American consumers and business community in mind, work with China for the shared goal to properly resolve the differences and problems in our trade ties. This serves the interests of both sides and of the world at large. Q: Burkina Faso announced last night that it was cutting off ties with Taiwan. When will the Chinese government open an embassy in Ouagadougou? Will China offer financial aids and preferential loans to Burkina Faso? A: The government of Burkina Faso yesterday issued a statement on severing the so-called "diplomatic relations" with Taiwan. The Chinese Foreign Ministry has immediately made clear China's attitude. We appreciate this move. We believe that the decision by the government of Burkina Faso is in the interests of its people and testifies to the one-China principle that is universally recognized by the international community. This is a correct decision made by the Burkina Faso government, in keeping with the trend of the times and the world. China has always stayed committed to developing friendly cooperative relations with countries around the globe on the basis of the Five Principles of Peaceful Co-existence and the one-China principle. You may not need to feel surprised if a country that stays committed to the one-China principle in keeping with the trend of the times and the world establishes diplomatic ties with China. Regarding whether China will offer assistance to the government of Burkina Faso, I would like to stress that this decision made by the Burkina Faso government independently is first of all a political decision, a correct one that conforms to the trend of the world. Speaking of any friendly country, China is willing to conduct mutually beneficial cooperation with it on the basis of mutual respect, equality and win-win results. China and African countries have conducted a lot of mutually beneficial cooperation under the framework of the China-Africa Cooperation Forum. If China and Burkina Faso establish diplomatic ties some day, we will carry out such cooperation under the same framework. We believe this is good to both sides. Q: According to reports, the DPRK announced on May 24 that it had demolished the Punggye-ri nuclear test site. What is China's comment? A: You may have learned from television that the DPRK has dismantled the Punggye-ri nuclear test site, a move welcomed by China. It is an important step made by the DPRK towards denuclearization, which is of positive significance to promoting the realization of the denuclearization of the Korean Peninsula and deserves appreciation and encouragement. We hope relevant parties will meet each other halfway and stay committed to advancing the denuclearization of the Peninsula and the political settlement of the Peninsula issue through dialogue and negotiation. 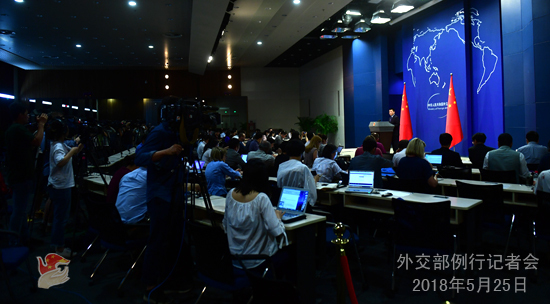 Q: China has said it will stay in the Joint Comprehensive Plan of Action agreement. Could you please explain what this means? If the US starts sanctioning Chinese companies doing business with Iran, how will China respond? Will it take pre-emptive measures against such sanctions? If the US demands that China reduce its imports of oil from Iran, will China comply and reduce its Iranian oil imports? Perhaps there are other specifics of China's intentions you could give to us? A: We stated China's position on the Joint Comprehensive Plan of Action (JCPOA) under the current circumstances at this podium before. We believe that the practice over the past three years or so has fully proved that the JCPOA is effective, which plays a positive role in upholding the international non-proliferation regime and safeguarding peace and stability in the Middle East. Under the current circumstances, we encourage all relevant parties to commit themselves to preserving and implementing the agreement and resolve each other's concerns through dialogue and negotiation on this basis. This is China's stance on the JCPOA, and it remains unchanged. As for the US government's new stance on the JCPOA and its ensuing effects, I can tell you responsibly that China and Iran, as two friendly countries, maintain normal economic and trade relations on the premise of not violating our obligations under international law. China has all along opposed the unilateral sanctions imposed by the US and other countries recently. This is our stance on the Iranian issue and other issues. Q: 21 Japanese were reportedly detained by Chinese police over religious activities. Are you aware of the relevant information? What is the reason for their detention? How will the Chinese authorities deal with that? A: I am not aware of the specifics, and I will refer you to the competent department. As a principle, I would like to reiterate that China is a country ruled by law. The Chinese law-enforcement agencies handle cases and safeguard the legitimate rights and interests of the persons concerned in accordance with the law. In the meantime, all foreigners in China should abide by Chinese laws and regulations and not engage in illegal and criminal activities. Q: Can you give us a timetable for when you might establish diplomatic relations with Burkina Faso? Has a Chinese team already gone to Ouagadougou? Can you give us details about your discussions with the Burkina Faso government on establishing diplomatic relations? A: Like I just said, there is no reason to feel surprised if China establishes normal diplomatic ties with a country that seeks friendly relations with us on the basis of the Five Principles of Peaceful Co-existence and adherence to the one-China principle. Q: New Zealand's Deputy Prime Minister and Foreign Minister met with Chinese State Councilor and Foreign Minister Wang Yi this morning, and this afternoon he will be meeting with Yang Jiechi, member of the Political Bureau of the Communist Party of China (CPC) Central Committee and Director of the Office of the Foreign Affairs Commission of the CPC Central Committee. Could you tell us if any consensus has been agreed with the New Zealand delegation and have any concrete outcomes been achieved from this visit? A: At the invitation of State Councilor and Foreign Minister Wang Yi, Deputy Prime Minister and Foreign Minister Winston Peters is on a visit in China from May 24 to 27. China-New Zealand ties are developing with a sound momentum. Last November, President Xi Jinping and Premier Li Keqiang met separately with Prime Minister Jacinda Ardern of New Zealand on multilateral occasions. The two sides agreed to deepen China-New Zealand comprehensive strategic partnership as well as practical cooperation in various fields. We hope that Deputy Prime Minister and Foreign Minister Peters' visit will help enhance political mutual trust between the two sides, expand mutually beneficial cooperation to a wider range of fields, and move forward China-New Zealand relations. We will release relevant information later. Q: Given these big changes in the US policies on the DPRK and the Iranian nuclear issue, what does China make of these big turnarounds? Does this give you cause for concern that you will also see some shifts in the US position on trade negotiations with China? A: You question is rather big. The US is an important member of the international community. We certainly hope that the US government could work alongside the majority of the international community, stick to multilateralism, and resolve issues through political and diplomatic means within the multilateral framework. As for the specific issues you mentioned, whether it is the Korean Peninsula nuclear issue, the Iranian nuclear issue, or the global trade issue, including some concrete problems in China-US relations, China's positions on them are quite clear. We maintain that China-US relations shall be moved forward on the basis of mutual trust, equality, mutual benefit, and win-win cooperation, and bilateral cooperation shall be strengthened in various fields. We also hope that other members of the international community, including the US, could follow this principle and commit themselves to a right path of forging a new type of international relations. Q: The past few days have seen the DPRK announce its decision to stop nuclear and missile tests and release three US hostages. Yesterday, the DPRK also blew up the Punggye-ri nuclear test site. Do you believe that the DPRK side has shown enough goodwill for the US-DPRK meeting? A: I have touched upon this in my answer to that previous journalist. For some time, the Korean Peninsula has been enjoying a hard-won momentum of dialogue and détente, thanks to the concerted and positive efforts made by all relevant parties, including the DPRK side. You just mentioned that the DPRK demolished the Punggye-ri nuclear test site, a decision made on its own initiative. In fact, in the letter to the Supreme Leader of the DPRK, President Trump also recognized these positive and goodwill gestures taken by the DPRK side. 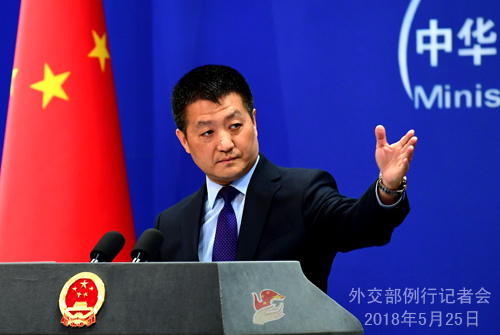 Frankly speaking, China fully acknowledges this string of positive measures taken by the DPRK side since the start of this year on its own initiative. We also hope that all relevant parties could meet each other halfway, demonstrate goodwill, and remain committed to resolving the Korean Peninsula issue through dialogue and consultation. What is imperative now is that relevant parties should jointly create atmosphere and conditions for the DPRK-US meeting to happen and to achieve positive progress. Q: Yesterday, German Chancellor Angela Merkel said when meeting with Premier Li Keqiang that dialogues on human rights issues could be carried out on the basis of equality and mutual trust. Can you give us more details? A: You asked about dialogues on human rights that came up during the meeting between the Chinese and German leaders. In fact, China is engaged in human rights dialogues with other countries on the basis of mutual respect to learn from each other and improve altogether. We always hold an open attitude in this regard. Q: There was a sentence in President Trump's letter, where he said to the DPRK leader that "if you change your mind, please do not hesitate to call me or write". Is China planning on doing anything towards helping this to happen? A: You know our position very well. We have been encouraging the US and the DPRK to have direct talks. We are doing that now and we will continue to do so. Like I just said, the DPRK and the US are parties directly concerned in the Korean Peninsula nuclear issue. A face-to-face and fruitful meeting between their two leaders will be pivotal in moving forward the Korean Peninsula denuclearization process. 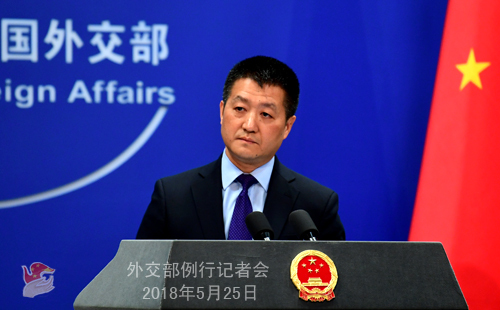 China will continue to work on the DPRK and the US in its own way while remaining committed to pursuing a resumption of dialogues on the Korean Peninsula issue.